The CFL's 2013 Most Outstanding Player, only the third Canadian ever to win that award and the CFL's first winner of the Lou Marsh Award as Canada's top athlete since Russ Jackson in 1969, looks to be walking away from the game at 31 (the official press conference is at 4 p.m. Eastern), and it appears that concussions may be a key reason why. 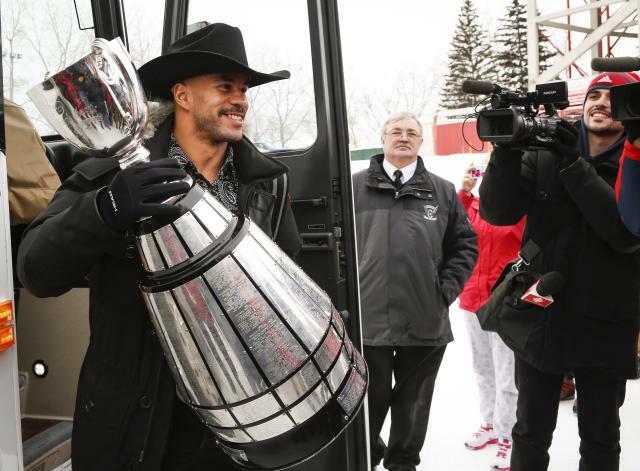 The athlete in question is Calgary Stampeders' running back Jon Cornish, who hasn't played since suffering what was initially termed "neck stiffness" following an Oct. 10 game against Edmonton and has been going through the CFL's concussion protocol without making much headway. Whether to leave football or not at this point is completely Cornish's decision, but from the outside, his history of head injuries (and other injuries) suggests this makes some sense for him despite his relative youth and talent. Losing a player of Cornish's stature and acclaim is a major blow for the CFL, though, and one that should hopefully redirect some focus towards head injuries, a vital and ongoing topic that received next to no discussion during Grey Cup Week. I would do something about the rules and hitting with your helmet. It’s a serious issue. I mean, do you really want your players dying? I don’t think it reflects well on leagues when players are having severe mental illness. I’ve had two hits to the head and neither one had any concussion symptoms. It was that I was almost decapitated. My neck was not in the position where I could play football. … If I were the commissioner, I’d have some say in player safety. I really don’t believe player safety is addressed too often. Does it have to take something bad to make things happen? Normally, it does. Most people prefer the status quo until the status quo doesn’t work anymore. “I do feel bad that I wasn’t able to give everything I could. Once you have a weak spot, people exploit it. I spent most of the start of the season defending my head against people head-butting me. What did that lead into? Breaking my thumb because I had to hit people’s helmets. Cornish would like the CFL to do more to eliminate head shots, but he’s not sure they will. Hebert was given a fine for his hit, while McCoil got nothing, so there is not much deterrent for players to stop. “(The McCoil hit) was a similar thing when you go up for a ball and you can’t defend yourself against being blown up. It jacks my head in such a way. It may be a more significant hit than the Kyries Hebert hit. Not just an arm it was entire shoulder pad into my head. Indeed. The most significant concussion problem facing the CFL may be the ongoing lawsuits from ex-players, but a close second is the way there are still so many problematic hits to the head, which are creating further concussions for current players. Moreover, when someone does call out what they see as hits to the head (as Cornish did on Twitter after this year's West Final, deleting the tweet and walking it back after some accused him of sour grapes), the response is typically along team and fandom lines. Regardless of if hits to the head are deliberate or not, there are still far too many of them in today's CFL, and that's going to lead to more early retirements from more spectacular stars like Cornish (who was named the CFL's Outstanding Canadian three years in a row from 2012 to 2014 in addition to his MOP and Lou Marsh wins in 2013). Cornish has had an incredible career on the field, helping to reestablish the value of Canadian running backs and showing that Canadians can be every bit as talented and valuable as Americans. He was also a great spokesman for the CFL off the field, playing a critical role in the league's pro-equality partnership with You Can Play, helping to teach football to kids through Jumpstart, and even taking time to talk with reporters on his lunch break at his job at a bank when he won the Lou Marsh. He leaves a strong legacy, and is a likely Hall of Famer despite his relatively-short career. It's awful to see his career end this way and not on his terms. Still, perhaps his warnings about concussions and head shots will be taken more seriously now. Hits to the head have just cost the CFL yet another great player, and Cornish is unlikely to be the last they knock out.